"These records are definitive." — Michael Fremer, editor, AnalogPlanet. RCA classical LPs — the gold standard for top quality orchestral performance and sound! Remastered and cut at 33 1/3 RPM by Ryan Smith at Sterling Sound Lacquers plated by Gary Salstrom and pressed on 200-gram vinyl at Quality Record Pressings! One of the best sounding recordings in the Living Stereo catalog, especially Side Two with The Comedians. "In 1938, Dmitri Kabalevsky provided incidental music for a play produced by the Central Children's Theater in Moscow, titled 'Inventor and Comedian. The score is light and witty and its expressive language quite direct, as was expected in Stalin's Soviet Union at that time. But here Kabalevsky was aiming at young audiences and had good reason to write tuneful, rather simple music. The play's plot deals with a traveling group of entertainers who are more clowns than comedians. Two years later Kabalevsky extracted 10 numbers from the score for his suite The Comedians, which would become his most popular work, with only the overture to his opera Colas Breugnon even remotely rivaling it. His effort was quite successful in distilling the work's best moments into a 15-minute suite, which he scored for small orchestra." .I'd have to say that the usual stumbling blocks have been sidestepped.Great care has been taken to do the right things, starting with the way the decision to remaster these RCAs was made." Jonathan Valin, The Absolute Sound. 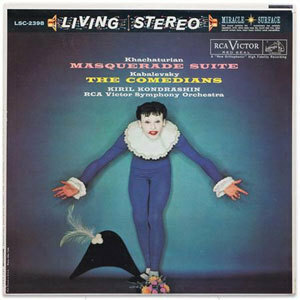 One of the best sounding recordings in the Living Stereo catalog, especially Side Two with The Comedians.